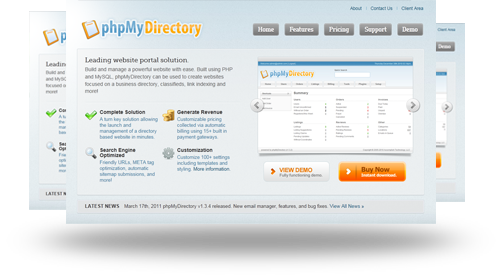 phpMyDirectory is a leading website portal solution. Build and manage a powerful website with ease. Built using PHP and MySQL, phpMyDirectory can be used to create websites focused on a business directory, classifieds, link indexing and more! Accomplish Technology, LLC specializes in web and mobile applications development and consulting. Based in Springfield, Missouri, we have clients all over the world who we have helped build and maintain successful websites. We are a dynamic team of technology professionals located around the world. Our business revolves around our flagship product phpMyDirectory where we provide support, maintenance, and customizations. We specialize in web application development based on Linux, Apache, MySQL, and PHP. We also provide services ranging from iPhone development to technology consulting. Use our online contact form to get in touch with us. Or you may find us on several popular social networking websites including Facebook, Twitter, and LinkedIn.